Give it your best shot before you go to the rest of the article below. I consider it likely that we shall have “genetically engineered carbon-eating trees” within twenty years, and almost certainly within fifty years. I like the sound of that: genetically engineered carbon-guzzling trees; that’s one “Innovative Technology” that might get our great-great grandkids to the far right of the net benefits scale. Another possibility just might be “hydrinos”—if they in fact turn out to be real instead of a hoax or a dead end. (I’ll be keeping an eye on hydrino “science,” too; the high-powered venture capital and high-profile board of director members are what got my attention). In any case, even if new technology can’t help, the winner would be a carbon tax. 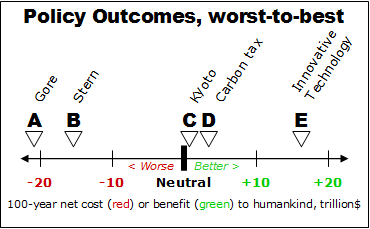 I think the politicians who could get the carbon tax adopted worldwide should get some kind of prize, don't you? Maybe a Nobel Peace prize, or something like that. Mitigation costs = $45T over the next forty years (from the recent EIA Report.) Plus, Kyoto should not even be considered as it never got fully implemented, and those countries that did implement it are seeing serious push back from their populace. I expect the next protocol to be even more ineffective and fail faster. That leaves us with A, B, D & E, "The sky is Falling" approach versus "Adaptation". Not all that difficult a decision is it. The world is about to invest 1% GDP MINIMUM on the word of a handful of biased ?scientists? There is another question – if we maintain 3% real GNP growth for 100 years we’ll be 19.22 times richer than we are now. Envisage what could be done with $14T x 19.22 = $269T annual GNP! This seems to urge caution. That is, the optimal policy seems to be go slow for now until the science of AGW is firmly established (if it ever is) with testable and repeatable measurements – not computer models with scores of exogenous parameters set by the “investigator”. I’m suggesting measure now, intervene later and if this imposes greater costs on our descendants later … so what? They’ll be much, much richer than we are. There is no reason to believe Mr. Mann, or his "hockey stick" graph of global temperature changes, is right. Questions were raised about Mr. Mann's paper almost as soon as it was published. In 2003, two Canadians, Ross McKitrick and Steven McIntyre, published an article in a peer-reviewed journal showing that Mr. Mann's methodology could produce hockey sticks from even random, trendless data. The report commissioned by the House Energy Committee, due to be released today (July 14, 2006), backs up and reinforces that conclusion. The three researchers -- Edward J. Wegman of George Mason University, David W. Scott of Rice University and Yasmin H. Said of Johns Hopkins University -- are not climatologists; they're statisticians. Their task was to look at Mr. Mann's methods from a statistical perspective and assess their validity. Their conclusion is that Mr. Mann's papers are plagued by basic statistical errors that call his conclusions into very serious doubt. WSJ unsigned editorial (Hockey Stick Hokum) July 14, 2006 - - Subscription required. Should have said Counter Revolutionary’s | 30 June 2008 at 11:50 post. Are the solutions presented in the book mutually exclusive? My understanding is that such things as emission limits and carbon taxes lead to the development of new technologies out of economic necessity. But then, you are the economist-- the voice of reason-- and I'll rely on you (and CoRev) to teach me in a fair and balanced way. 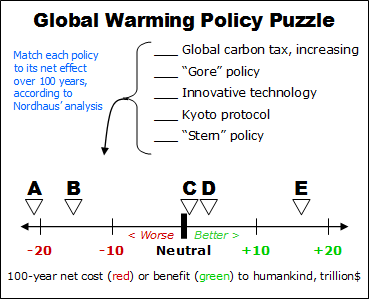 While the cost/benefit of Gore's proposed policies can be debated, it is abundantly clear that he does not practice what he preaches. His carbon footprint is many multiples of the average American. When it comes to the environment, Al Gore's pitch is best described as "Do as I say, not as I do." ... And for this he was honored?!!! And GoodMacro, your point is??? You can't be expecting justice nor rationality?